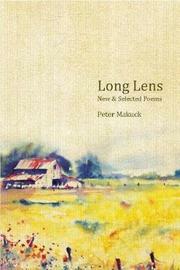 "Peter Makuck sees through the detritus of daily life to what matters...It's that essence that lives deep in things, looked for in people, sea- and landscapes, and creatures, that lifts the quotidian toward the marvelous, and animates this selection of poems from four decades." --Brendan Galvin From "Long Lens": Folding laundry, I can see our clothesline waving its patches of color like the flag of a foreign country where I had happily lived in a small clapboard house surrounded by pines. I can hear my mother in her strong accent saying she didn't want a dryer even when we could finally afford one-- Our sheets won't smell of trees and sunlight anymore. Long Lens represents forty years of Peter Makuck's work, including twenty-five new poems. With precise language, Makuck's imagery evokes spiritual longing, love, loss, violence, and transcendence. His subjects include the aftermath of the 1970 killings at Kent State University; scuba diving on an offshore shipwreck; flying through a storm in a small plane; rescuing a boy caught in a riptide; and lucid observations of spinner sharks, a gray fox, a spider, and a pelican tangled in a fishing line. Peter Makuck taught at East Carolina University from 1976 to 2006, and founded Tar River Poetry. He was 2008 Lee Smith Chair in Creative Writing at NC State University. Winner of the Brockman Award and the Charity Randall Citation, he lives on Bogue Banks, one of North Carolina's barrier islands. The Cortland Review: "The easy-going manner...of these poems should not blinker us to the fact that they are also polished and load-bearing when they seem least to be. In fact, it is as accomplished for what it doesn't do, as for what it does...it's formally adroit without being arty, and its manner invites the reader without manipulation. Founder of Tar River Poetry and editor for 30 years, Peter Makuck taught at East Carolina University from 1976 to 2006. His stories, poems, reviews and essays appear in Poetry, The Nation, Hudson Review, The Sewanee Review, and The Georgia Review. He is author of four volumes of poetry, two short story collections, and co-edited a book of essays.